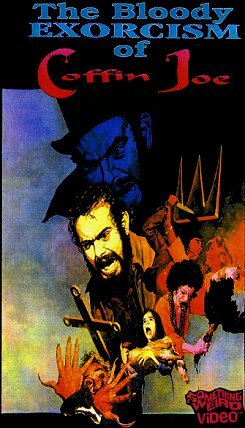 Even before Wes Craven had come up with the character of Freddy Kreuger, much less the idea of bringing him into the real world, José Mojica Marins brought his character, Coffin Joe, in to the real world in this 1972 color film. José Mojica Marins decides to spend Christmas at the house of his friends. He decides that he will write his latest movie there. But during his stay, starnge things start to happen. At first, chairs are moving by themselves and lights flicker on and off. But eventually, family members start becoming possesed and Marins must find put why. It turns out that the oldest daughter, Vilma, has been promised to the son of Satan! Deep within the house, a secret altar room is discovered and the possed members of the family are in a bizarre ritual at the feet of Coffin Joe himself. Marins must fight his own creation in order to save the souls of his friends!